Berdouse E., Vaidyanathan T. K., Dastane A., Weisel C., Houpt M., Shey Z., Mercury Release from Dental Amalgams: An In Vitro Study Under Controlled Chewing and Brushing in an Artificial Mouth, J. Dent. Res. 1995;74(5):1185-1193. Ellender G., Feik S., Gaviria C., The biocompatability testing of some dental amalgams in vivo. Australian Dental Journal 1990;35(6):497-504. Chew C. L., Soh G., Lee A. S., Yeoh T. S., Comparison of Release of Mercury from Three Dental Amalgams, Dent. Mater. 1989;5:244-246. The release of mercury vapour from Class I amalgam restorations prepared in human molar teeth was studied during chewing simulations in an artificial mouth of a bi-axial servo hydraulic mechanical test system. So that the total mercury released from the restoration over a fixed time could be determined, a closed chamber surrounded the envelope of chewing motion. In addition, the influence of sampling frequency on mercury release was corrected by the use of different sampling frequencies over a fixed time interval of mercury release measurement and extrapolation to zero sampling time. Thus, a combination of a closed environment and extrapolation method to determine the mercury release under continuous sampling was used to determine mercury released under normal breathing conditions. The measured mercury release rate data were used to calculate the potential daily mercury dose in a patient due to a single amalgam restoration, following the method previously outlined by Berglund. The mercury release from both a conventional and a high copper amalgam was evaluated at different age intervals after the restoration was placed in the teeth. The results show that while the age of the amalgam and the amalgam type influence the extent of mercury release during the initial non-steady-state conditions, the steady-state value of mercury daily dose due to a single amalgam filling is 0.03 lg/day, which is well below the calculated threshold limiting value (TLV) of 82.9 lg/day considered dangerous for occupational exposure in the United States. The release of mercury vapour was measured and the daily dose calculated for a single restoration for up to 30 days. The data measured indicates SDI’s F400 alloy releases less mercury than Tytin and that the release and daily dose decreases with the age of the amalgam. The biological responses to some dental amalgams were determined in vivo and compared with those of dental porcelain. The technique of implantation employed in the study addressed some of the vagaries of the recommended standard Practices for Biological Evaluation of Dental Materials (RSP) and considered both cellular responses (inflammation, infiltration and fibrogenic cell activity) and the organizational status of the resultant encapsulation. The implantation sites for both the experimental and control were biogeometrically similar unlike those currently recommended in RSP. At the end of the test period, all the dental amalgams tested caused minor responses reflected by the formation of thin capsules with an acceptable matrix organization. The Australian manufactured dental amalgams – Permite, Lojic, F400, New Ultrafine and GS80 all produced even capsules with quiescent cells. By one hundred days, the capsule around Dispersalloy, although generally well formed, showed some areas of cellular activity and matrix variability. The biological responses to all the dental amalgams examined were mild and considered to be acceptable for clinical usage. The matrix organization of enveloping capsules must be considered in the determination of the biocompatibility of a dental restorative material. (Received for publication October 1988. Revised June 1989. Accepted October 1989). F400 along with 4 other SDI alloys was studied for biocompatibility. Cellular response (inflammation, infiltration and fibrogenic cell activity) and organisational status of the resulting encapsulation was considered. F400 is described as producing even capsules with quiescent cells and performed better than the control alloy, Dispersalloy. 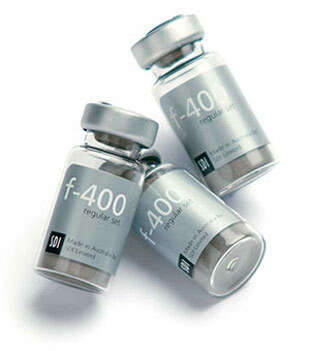 The biological response of F400 is reported as being mild and considered to be acceptable for clinical usage. Mercury release from dental amalgams has generated considerable concern in recent years and is the subject of this study. Specimens of one admixed high-copper amalgam (Contour), one lathe-cut low-copper amalgam (SDI), and a new tin and copper free amalgam claimed to be non-mercury-releasing (Composil) were evaluated for release of mercury when incubated in purified water at 37âC. Measurement of mercury was done by cold-vapour atomic absorption spectrophotometry, and the amount released was expressed as lg/cm2/24 hr. Study was conducted over a four-week period. Results show that Contour and SDI released similar insignificant amounts (mean release of <0.1 lg/cm2/24 hr. compared with Composil (mean release of 41.0 lg/cm2/24 hr). The difference in release by Composil compared with that by Contour and SDI is highly significant (P<0.001). The implications of chronic release of mercury from dental amalgams are discussed. Long-term release studies are in progress. F400 was tested alongside Composil and Contour to determine the mercury released during incubation at 37âC in purified water. Over the 4 week period F400 and Contour behaved similarly with low release in marked contrast to the very high mercury release by Composil.